Horizon Family Solutions understands and is committed to the philosophy that each of our clients have the opportunity to achieve their individual potential. 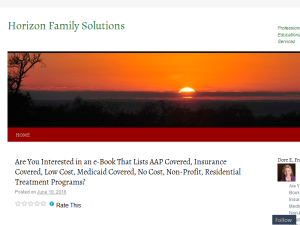 This what your Horizon Family Solutions Blog Ad will look like to visitors! Of course you will want to use keywords and ad targeting to get the most out of your ad campaign! So purchase an ad space today before there all gone! BOULDER, COLORADO. March 30, 2017 — Horizon Family Solutions, LLC has been selected for the 2017 Best of Boulder Award in the Educational / Therapeutic Consultants category by the Boulder Award Program. This is the fifth year in a row that Horizon Family Solutions has been honored by the Boulder Award Program. “I am greatly honored by this award. Indeed, the best award that exists is the one given by one’s own community, those who know your work. I want to thank the Boulder Award Program who works to acknowledge all the achievements of businesses in Boulder, Colorado,” Frances states. Each year, the Boulder Award Program identifies companies that they believe have achieved exceptional success in their local community and business category. These are local companies that enhance the positive image of small business through service to their clients and our community. These exceptional companies help make the Boulder area a great place to live, work and play. Various sources of information were gathered and analyzed to choose the winners in each category. The 2017 Boulder Award Program focuses on quality, not quantity. Winners are determined based on the information gathered both internally by the Boulder Award Program and data provided by third parties. Horizon Family Solutions, LLC was founded by Doré E. Frances, PhD in February 2001. In March of 2017 Julie Forland, M.Ed. joined the company and together they use their extensive experience in working with children, adolescents and young adults. Frances and Forland bring common sense, compassion, experience, and wisdom to their mission of working with children, adolescents, young adults and their families. Combined together Frances and Forland have over 50 years of experience. Options for families have become more complex and challenging. Frances and Forland provide individual attention to each client and they receive their full and undivided attention from the initial contact with parents to the completion of their child’s journey through their program or school. They make the best possible decisions for each one of their client’s academic future and emotional health. Their empathy, expertise, and objectivity guide the family through the entire process. The Boulder Award Program is an annual awards program honoring the achievements and accomplishments of local businesses throughout the Boulder area. Recognition is given to those companies that have shown the ability to use their best practices and implemented services to generate advantages and long-term value to their clients. The Boulder Award Program was established to recognize the best of local businesses in our community. Our organization works exclusively with local business owners and professional associations. Our mission is to recognize the small business community’s contributions to the U.S. economy. Forland’s focus is on placing the right student in the right educational setting. Her background has helped to make an easy transition into her current position as Educational Consultant with Horizon Family Solutions. Horizon Family Solutions serves clients all across the United States, Canada, and Internationally. We familiarize families with opportunities to obtain a high quality of education and treatment, along with a high level of service. This can be a leader in your professional career and it can also be being a leader in your own personal life. Your personality style dictates how well you lead others and how well you adhere to your own personal life of leadership in all you choose to do for yourself. 12 Steps to Self-Analysis and Self-Improvement in both personal and professional arenas, making it possible for you to “jump start” your career or move toward empowerment for yourself. Please email d.frances@me.com to be added to to the list for more information. Add CLASS to the Subject line. Despite our best efforts, there are some teens and young adults who are just more susceptible to the negative influences among peers, what is on the Internet and on TV. There’s also the challenge of too much uncensored content on cell phones and in video games…and it’s hard to keep track of what your teenager or young adult is watching or reading or participating with on a daily basis. Your teenager or young adult may be in trouble more than you know. You need to get into the details of this matter as soon as possible. When left untreated, these problems can develop into even more severe problems in later life. Wilderness therapy programs have a lot to offer. They are short, running between 45 and 90 days. They are ideal to help a teen or young adult in trouble giving them the time and space to break away from the source of their challenges and problems. Wilderness programs are much shorter than residential boarding school stays and less punitive and rigorous than boot camps, of which Horizon Family Solutions never recommends. They are an ideal choice for many troubled teens and young adults. It needs to be understood that a therapeutic wilderness program will not be the perfect place to send every troubled teen or young adult. Making the choice involves at least two factors. When this has been determined, which wilderness program and therapist best suits your teen, young adult and family? You can get the therapy sessions your teen or young adult might need by going to a therapist in your local area on a weekly basis. Each time that happens, your teen or young adult then returns home to their family and friends. The best way to make a major impact on your teen’s life is to make a break, take a break. Get away from the routine and contacts which have been a big part of their challenges, problems and troubles. Parents with worries about the safety of their teen or young adult while in wilderness can be assured that the best wilderness programs do not accept everyone. The aim is to find like-minded teens and young adults who need direction, guidance, inspiration and mentoring in their life. The academic side of a wilderness program is in most cases able to be transferred back to the teen’s school as credit. There are a lot of good therapeutic wilderness programs for troubled teens and young adults that can give them the help that they need. They have an admissions or screening process in place to determine whether your teen or young adult can really be helped by their program. It’s a good first step towards your family’s healing. A lot of wilderness therapeutic programs are located in Colorado, Georgia, Hawaii, Idaho, Maine, Montana, North Carolina, Oregon, Utah, and Vermont. There are a range of different types of wilderness therapy programs all across the United States, with a range of models and approaches. When needing assistance, please contact Horizon Family Solutions at 303-448-8803. Antisocial personality disorder is a disorder that is characterized by a long-standing pattern of disregard for other people’s rights, often crossing the line and violating those rights. A person with antisocial personality disorder (APD) often feels little or no empathy toward other people, and doesn’t see the problem in bending or breaking the law for their own needs or wants. The disorder usually begins in childhood or as a teen and continues into a person’s adult life. Antisocial personality disorder is often referred to as psychopathy or sociopathy in popular culture. However, neither psychopathy nor sociopathy are recognized professional labels used for diagnosis. Individuals with Antisocial Personality Disorder frequently lack empathy and tend to be callous, cynical, and contemptuous of the feelings, rights, and sufferings of others. They may have an inflated and arrogant self-appraisal (e.g., feel that ordinary work is beneath them or lack a realistic concern about their current problems or their future) and may be excessively opinionated, self-assured, or cocky. They may display a glib, superficial charm and can be quite voluble and verbally facile (e.g., using technical terms or jargon that might impress someone who is unfamiliar with the topic). Lack of empathy, inflated self-appraisal, and superficial charm are features that have been commonly included in traditional conceptions of psychopathy and may be particularly distinguishing of Antisocial Personality Disorder in prison or forensic settings where criminal, delinquent, or aggressive acts are likely to be nonspecific. These individuals may also be irresponsible and exploitative in their sexual relationships. A personality disorder is an enduring pattern of inner experience and behavior that deviates from the norm of the individual’s culture. The pattern is seen in two or more of the following areas: cognition; affect; interpersonal functioning; or impulse control. The enduring pattern is inflexible and pervasive across a broad range of personal and social situations. It typically leads to significant distress or impairment in social, work or other areas of functioning. The pattern is stable and of long duration, and its onset can be traced back to early adulthood or adolescence. Because personality disorders describe long-standing and enduring patterns of behavior, they are most often diagnosed in adulthood. It is uncommon for them to be diagnosed in childhood or adolescence, because a child or teen is under constant development, personality changes and maturation. According to the DSM-5, antisocial personality disorder cannot be diagnosed in people younger than 18 years old. Antisocial personality disorder is 70 percent more prevalent in males than females. According to research, the 12-month prevalence rate of this disorder is between 0.2 and 3.3 percent in the general population. Like most personality disorders, antisocial personality disorder typically will decrease in intensity with age, with many people experiencing few of the disorder’s symptoms by the time they are in the 40s or 50s. Personality disorders such as antisocial personality disorder are typically diagnosed by a trained mental health professional, such as a psychologist or psychiatrist. Family physicians and general practitioners are generally not trained or well-equipped to make this type of psychological diagnosis. So while you can initially consult a family physician about this problem, they should refer you to a mental health professional for diagnosis and treatment. There are no laboratory, blood or genetic tests that are used to diagnose antisocial personality disorder. Many people with antisocial personality disorder don’t seek out treatment. People with personality disorders, in general, do not often seek out treatment until the disorder starts to significantly interfere or otherwise impact a person’s life. This most often happens when a person’s coping resources are stretched too thin to deal with stress or other life events. A diagnosis for antisocial personality disorder is made by a mental health professional comparing your symptoms and life history with those listed here. They will make a determination whether your symptoms meet the criteria necessary for a personality disorder diagnosis. Researchers today don’t know what causes antisocial personality disorder. There are many theories, however, about the possible causes of antisocial personality disorder. Most professionals subscribe to a biopsychosocial model of causation — that is, the causes of are likely due to biological and genetic factors, social factors (such as how a person interacts in their early development with their family and friends and other children), and psychological factors (the individual’s personality and temperament, shaped by their environment and learned coping skills to deal with stress). This suggests that no single factor is responsible — rather, it is the complex and likely intertwined nature of all three factors that are important. If a person has this personality disorder, research suggests that there is a slightly increased risk for this disorder to be “passed down” to their children. Treatment of antisocial personality disorder typically involves long-term psychotherapy with a therapist that has experience in treating this kind of personality disorder. By Doré E. Frances, PhD -Teens with conduct disorders and antisocial personality conditions are more resistant to authority figures and possible treatment options offered. What this means is that traditional means of eliciting positive behaviors might be harder to accomplish with teens with CD. Difficult maybe, however, not impossible. Studies and researchers suggest a combination of individual and family/group therapies aimed at developing problem-solving and interpersonal skills. Often these teens do not know how to properly interact with others (or choose not to), so therapies that involve peers and how to function in different situations may prove helpful. Families especially can have a hard time in dealing with conduct disorder. Parents or siblings may become fearful or anxious around the antisocial teen, unsure if the adolescent will respond harshly or violently. Having family-centered therapy helps both parties to discuss the issue at hand and construct ways in which the parents, siblings, and the affected teen can cope. Similarly, it may be the parents who need a behavioral adjustment as well. Not knowing how to react to a child with CD or other antisocial behaviors can trigger frustration, nervousness, anger, or violent outbursts. In other cases, parents can avoid the child altogether. In parental management therapy, it’s important to know that in order for a teen to change, the parent may need to change as well. Sometimes the most longstanding outcomes are a result of the parents working together with the child, with both parties understanding the importance of change. Cognitive behavioral therapy can help to develop skills that foster independence and critical thinking. Considering that antisocial behavior may in part be brought on by an adolescent trying to alter his/her environment, teaching a teen these skills may make them feel more in control of their surroundings and thus, more at ease. Many therapies focus on these skills as well as those that promote social and communicative behavior. Learning how to express emotions in a healthy way, nurturing one’s cognitive and emotional development, and feeling supported can make a huge difference in how an adolescent responds and acts.While no one can ever predict the outcome of treatment and how it relates to antisocial behaviors in the future, getting assistance now can mean a world of difference for you, your teen, and your family. Without treatment, these already stressful actions can escalate into long-term problems. When you feel troubled by your teen’s behavior and suspect a more serious problem, please call Horizon Family Solutions. We understand the importance of family and value your child’s health. Call now. The Coyote Coast Transition Program supports teens and families in maximizing gains and continuing the momentum established in out-of-home treatment such as, wilderness therapy, rehabilitation programs, residential treatment and therapeutic boarding schools. Most youth experience success in out-of-home programs largely due to the high degree of structure and tight time management housed within them. These highly therapeutic programs often also succeed in helping youth to develop improved coping skills, insight, control over their behavior, and communication. However, research has shown that without continued after-care services, both parents and youth report declines in interpersonal relations, which include youth’s relationships with parents and other adults, as well as interaction with friends, aggressiveness, arguing and defiance. In our after-care work, we find that the gains made by youth in their out-of-home programs are better sustained when we help to bring structure and consistency into the home. This is more easily achieved when we become involved early in the return-to-home planning process. Ample time is needed to co-construct a carefully tailored home agreement and aftercare plan using important input from parents, youth, the treatment program, and other involved professionals. *Russel, K. C. (2002). Longitudinal Assessment of Treatment Outcomes in Outdoor Behavioral Healthcare. (Technical Report 28). Idaho Forest, Wildlife, and Range Experiment Station, Moscow, ID: Available from the University of Idaho Wilderness Research Center – Outdoor Behavioral Healthcare Research Cooperative. If you are the owner of Horizon Family Solutions, or someone who enjoys this blog why not upgrade it to a Featured Listing or Permanent Listing?